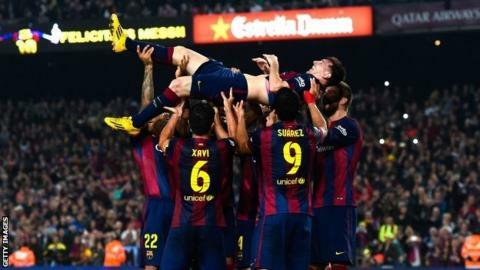 Barcelona's Lionel Messi is "the greatest player in football history", says president Josep Maria Bartomeu. The Argentine, 27, is the all-time top scorer in Spain's La Liga with 253 goals following his hat-trick in Saturday's 5-1 win over Sevilla. Bartomeu said: "We'll have Leo here for many more years. We are delighted with what he has achieved. "We knew the record was going to come. It made me very happy to see him equal it, for him and for the club." The four-time world player of the year has scored 368 goals in total for Barcelona, his only senior club, and 45 for Argentina. Messi - who is also the joint top scorer in Champions League history with 71 - had recently said his future was "complicated", but his father played that down soon afterwards. Bartomeu said: "There are no words to describe what he is doing. He is happy at Barcelona, where he has been for so many years, and he gets on well with his team-mates. "He's concerned about non-sporting issues but the club is supporting him. People should speak to him about football rather than other things." After the game, Barca head coach Luis Enrique said he thinks Messi will extend the record, which had previously stood since 1955, so much it will become "unreachable" for anyone else.